When i lived back in the US, i was using Time Warner for a few months and would d/l on average about 80 gig's to 120 per month - this was back in '02. i only used their service for a few months because i got a notice in the mail that stated i was violating their Fair-Usage Policy which states that i will not exceed two gigabytes per MONTH. *lame* So, i quickly discontinued my service and a short time later i moved to Germany. Since then, i have never run across this problem again. Now a day's i average about 780 gig's - 1.5Tb of content a month, depending on the weather outside. My question is to those that live in the US: Do the ISP's over there still send out those letters to their customers, and if so, what are the guidelines? 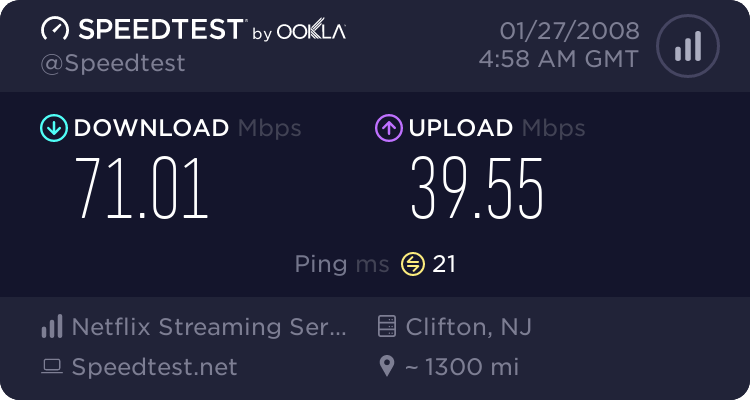 i've also read that Verizon is offering their customers FiOS which is suppose to offer their customers up to 30Mb/s down, but i'm curious how much of that i'm actually able to "use" per month? I have Roadrunner right now and have downloaded close to 1tb this month and last month with no problems. Originally Posted by ..:: c.R ::.. Such limitations are virtually only those systems (cablemodems, wireless including satellite, etc.) that are 'shared' systems, where the data path is like a party line service, where all the subscribers are fighting for the same bandwidth. There are a very small number of DSL systems that operate kinda the same way, in that they have bandwidth/throughput limitations, but usually because of the VERY low cost to the subscribers. But real internet service, like that provided through dedicated lines straight to major internet hubs/routers (like DSL or some fiber based services) don't have ANY such nonsense. As an example, I run my two DSL links (one through the local telco, the other through a reseller utilizing the telcos copper plant), and virtually 100% all the time, all day long (24hrs) and all month long (30-31 days). NEVER have I been 'throttled' or likewise slowed down. I know I'm directly connected to an internet router running at 10gbits/second, and 'share' that with some 200 other subscribers. That, and basic internet infrastructure, is the only 'sharing' my line(s) do. Cablemodem folks usually 'share' the 'circuit' with thousands of other customers, on a bandwidth limited system. Samo with wireless folks, whether terrestrial or satellite. I usually have to hold myself from falling off the couch when the local cableco runs their adverts, saying that DSL is 'slow'. The smallest DSL line I have (from the local telco) is TRIPLE the speed of the cable sytem, IF that system would provide the actual speed they 'quote' on the adverts. Which they don't. I use RR's service, download on average a few hundred gigs a month... no problems.